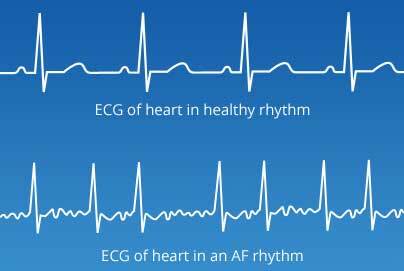 Atrial fibrillation (AF) is the most common heart rhythm disturbance encountered by doctors. It can affect adults of any age, but it is more common as people get older. In the over 65 year old age group, it affects about 10% of people. AF occurs when chaotic electrical activity develops in the upper chambers or atria and causes these chambers to quiver (or 'fibrillate'), rather than beat normally. This can mean that your heart does not pump blood around your body as efficiently as it should. As a result, the atria no longer beat in an organised way, and pump less efficiently. The AV node can stop some of these very rapid impulses from travelling to the ventricles, but the ventricles will still beat irregularly and possibly rapidly. The main risk associated with AF is stroke. This occurs because the atria are fibrillating and not beating in a co-ordinated way. The lack of sufficient contraction means that the blood in the atria becomes stagnant and can form clots. These clots can break off and travel anywhere in the body. If they travel to the brain, they can cause a stroke. surgical procedures, used in rare cases, to try to make your heart beat normally. risks associated with each treatment option.